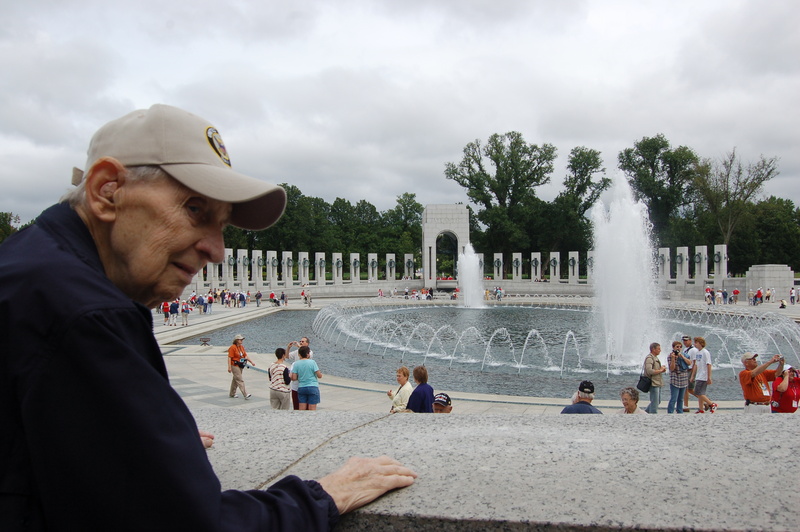 My father, Richard H. Stambaugh, achieved a long-time goal when he was able to visit the World War II Memorial in Washington, D.C. on September 12, 2009 thanks to Honor Flight. As part of a photographic review of the 21st century's first decade, this picture appeared on the front page of the NewYorkTimes.com on December 24, 2009, three days after Dad died. The original article was first published on Nov. 11, 2011. I am republishing a revised version today in honor of Veteran’s Day in the U.S. and for all those who work globally for peace. 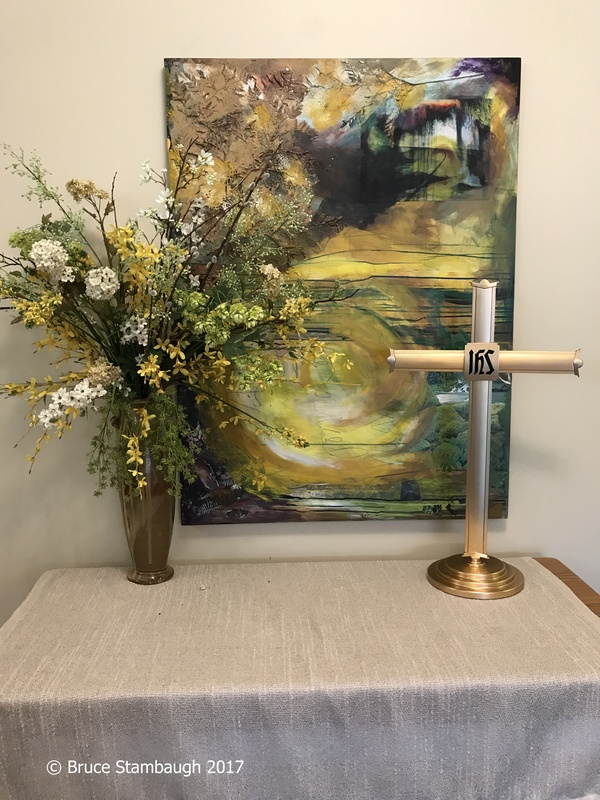 The very first sermon I heard preached in a Mennonite church 40 years ago was on nonresistance. That was precisely what I was looking for spiritually, and I embraced it. My father, a World War II veteran, was skeptical, but eventually accepted my decision. Now years later, I was to accompany my 89-year-old father on a special excursion called Honor Flight for World War II vets. Dad was dying of cancer, and he had long wanted to make this trip to Washington, D.C. Regardless of physical condition, each of the 117 vets on the plane was required to have a guardian for the all-day round-trip. Given his physical situation, Dad needed extra care. Given my nonresistance stance on war, I was reluctant to go. I likely would be the only conscientious objector on the packed plane. But this trip wasn’t about me. It was about my father fulfilling one of his dreams. To help him accomplish that, regardless of my personal convictions, I needed to go with him. As anticipated, the vets received their patriotic just due. Upon arriving at Reagan National Airport in Washington, D.C., fire trucks sprayed arches of water across our arriving jetliner. This ritual was usually reserved for dignitaries. As we exited the plane and entered the terminal, a concert band played patriotic music. Red, white and blue balloons were everywhere, and hundreds of volunteers vigorously greeted us. 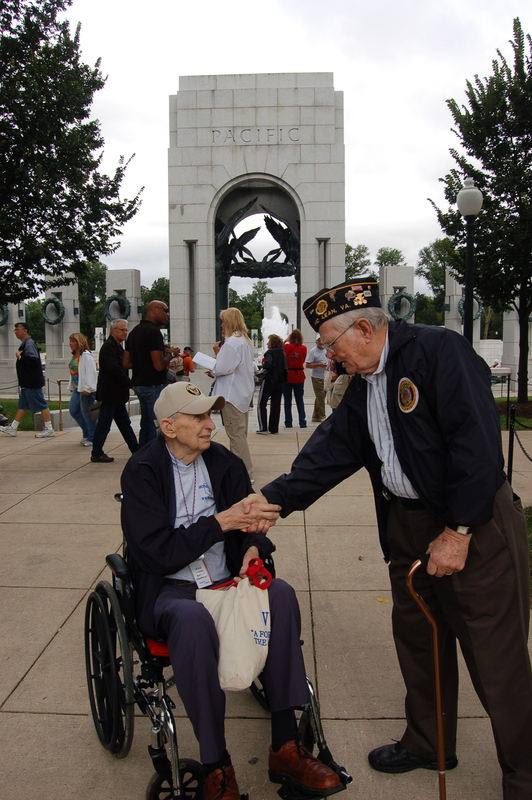 Another veteran was the first to welcome Dad to the World War II Memorial in Washington, D.C.
At the circular, mostly granite World War II memorial, strangers came up to the vets and shook their hands and thanked them for their service. I emotionally took it all in, focusing my attention on caring for my elderly father. The entourage visited several other war monuments in the U.S. capital that day, too. Back at the airport, we had left in the morning, the vets received a similar patriotic welcome home. Dad said this experience ranked right behind his 67- year marriage. With that comment, I was exceedingly glad that I had had the chance to experience that day with my father. I felt honored to have been able to accompany him on his most significant day and glad he had gotten to go. Dad died three months later. 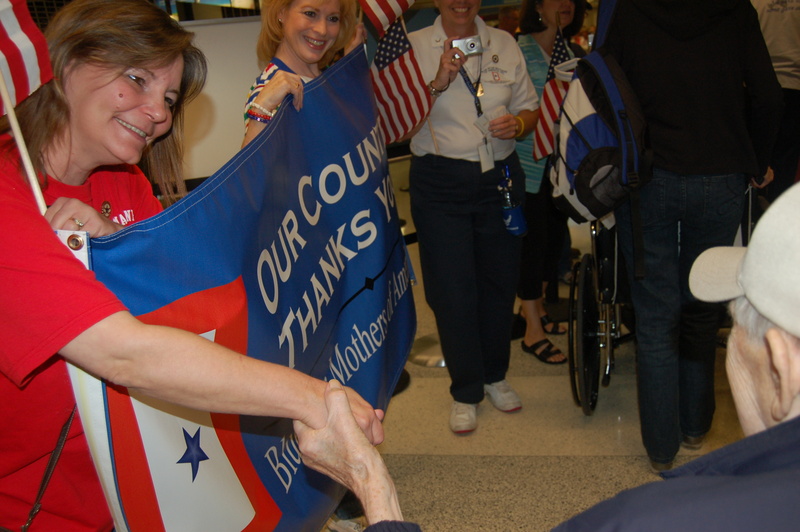 Hundreds of well-wishers greeted the vets upon their return to Ohio. also remembered the words of Jesus, when he said to turn the other cheek and to go the second mile and beyond for your enemy. For a day I had had one foot on the foundation of God and country, and the other on the teachings of Jesus. The trip with my father was an inspirational reminder of the commitment I had made as a young man to a different way of making peace in a hostile world. 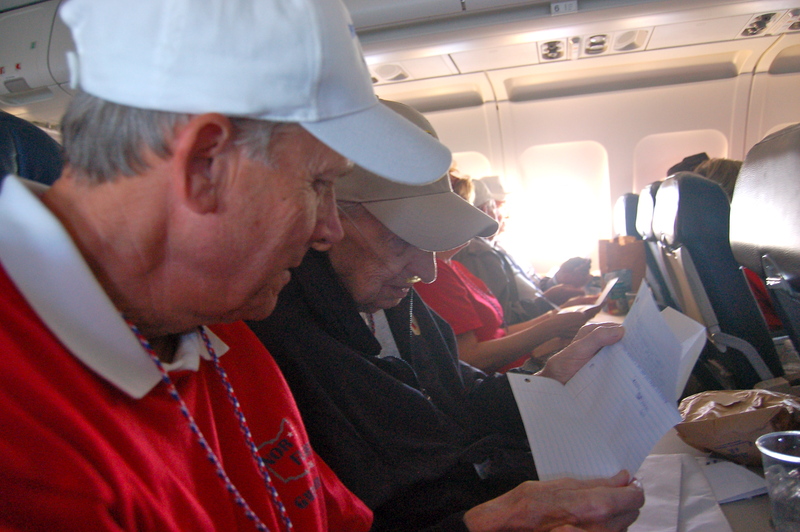 Each vet on the Honor Flight received letters to read during mail call on the flight home. Because of this experience, I had bonded with my father in his time of need, and I greatly respected what my father and the other veterans on the flight had done. And yet, I knew I could not have done what they had, not because of cowardice, but out of conviction. 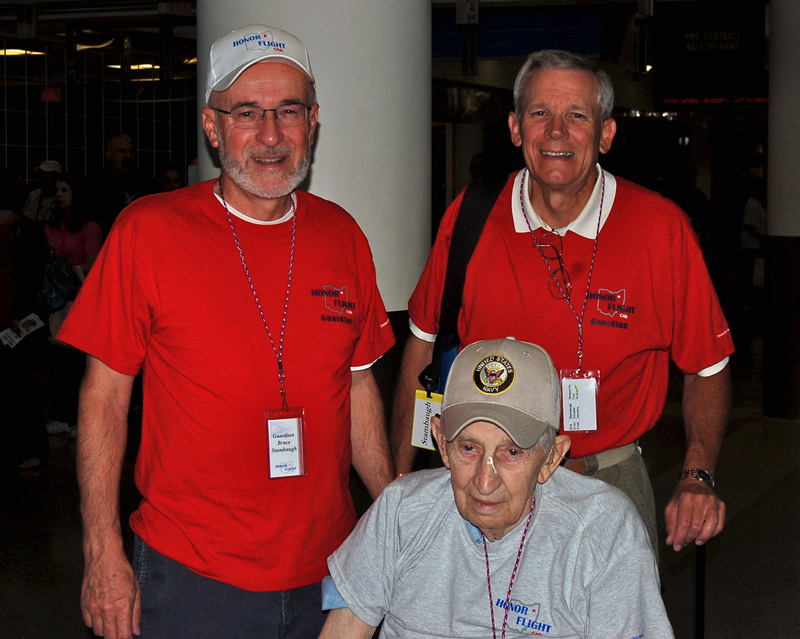 I had participated in the Honor Flight out of love and respect for my earthly father. I had held fast to my peace convictions out of love and devotion to my father in heaven. In that paradox, I had found no conflict whatsoever. 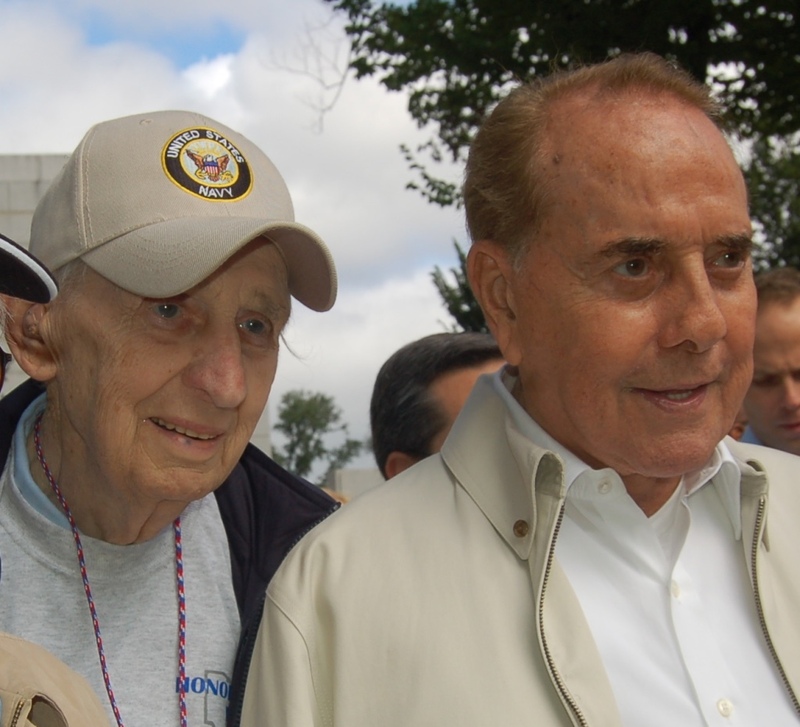 When Dad spied Senator Bob Dole, who forged the way for the World War II Memorial, he rose out of his wheelchair and shuffled and squeezed his way beside the senator. This first article appeared in Rejoice!, the daily devotional for Mennonite Church USA. This photo needs no explanation, no caption. Just enjoy the view. 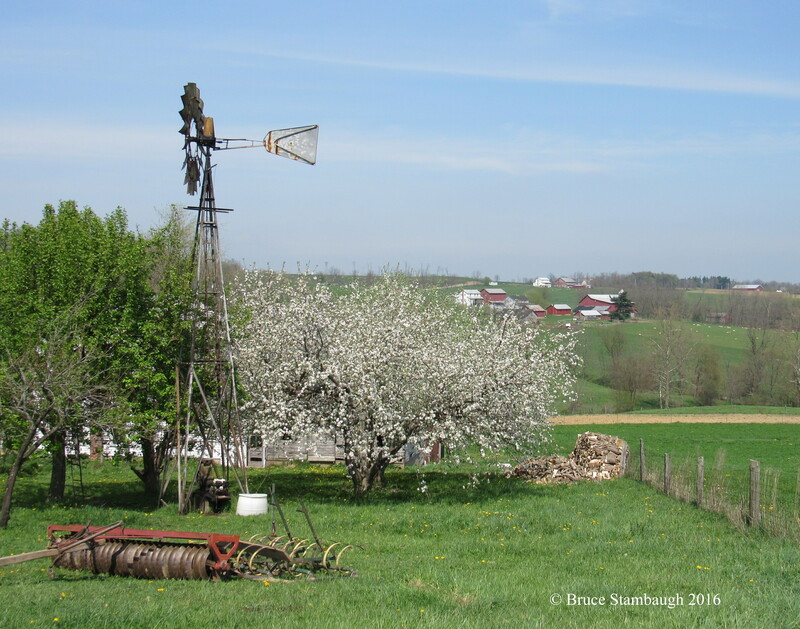 “Blossoms with a view” is my Photo of the Week. What can I say? It’s winter. It’s Ohio. It snows. It’s also beautiful in Ohio’s Amish country. “In the storm” is my Photo of the Week. My wife and I made an impromptu, important decision. We broke a long-standing tradition for the perfect reason. For the last 40 years, we have always had a live Christmas tree grace our home. That won’t happen this year. The live tree always stood centered in front of the living room windows for most of December. This year an attractive, used artificial tree retrieved from a local thrift store fills that spot. Our first live trees weren’t cut either. They still had their roots bound in burlap. After Christmas, we transplanted the trees in the yard of our first home we built four years after our marriage. When we moved to our present home 36 years ago, we switched to live, cut trees. Both my wife and I had grown up with fresh cut trees in our homes for the holidays. My family often took excursions to select just the right tree. Dad used the saw, and us kids would help carry the piney prize back to the car. We continued that Yuletide tradition with our children. We loved the family experience, the exhilaration of the nip in the December air in Holmes County, Ohio. My favorite Christmas trees growing up were the Scotch pines. I loved their long, soft needs as opposed to the stiff, prickly ones of the Colorado blue spruce species. In recent years, my wife and I tried Fraser, Douglas, and Concolor firs. They all kept their needles longer than other species and filled the house with a pleasant, conifer fragrance. Their soft, bluish-green coloration added a festive flair, too. With all of these positive traits, why would we change now? The truth is, we hadn’t intended to switch. We went looking for a Concolor that would serve a dual purpose. We would again get a balled tree first to serve as our Christmas tree. After the holidays, we would plant it to replace a mature blighted blue spruce removed from our side yard last summer. We found a small, balled Concolor at our first stop. It was hardly three-feet tall, much smaller than we had in mind. Then we got an idea. We bought the little tree and planted it where the stately blue spruce had been. We chose this lovely fir to serve as an evergreen memorial to our dear friend, Jenny Roth Wengerd, who died on Sept. 11 from a brain hemorrhage at age 47. The tree was about the size of Jenny when we first met her at age three after her adoption from South Korea. Neva and I witnessed her naturalization as a U.S. citizen. We often cared for Jenny and her siblings while their parents were away. She and her family stayed in our house the day their home burned down. We mourned with the family when Jenny’s brother, Steve, died of cancer at 25. We had been through a lot together. Jenny was as beautiful and compassionate as a human could be. She radiated love and joy to all who knew her. Planting a tree to her memory only seemed fitting. Only a single ornament adorns this extra special Christmas tree. A simple, translucent angel watches over this dedicated evergreen. We will celebrate Christmas with a fake tree this year just as joyfully as if it were a fragrant, beautiful fir. Outside our Jenny tree will sink its roots into the earth, a living memorial to our gregarious friend who died much too soon. Clouds intrigue me. I know I’m not alone in that sentiment. While driving some back roads in rural Wayne Co., Ohio, I spotted this unusually shaped and colored cloud formation. To use the scientific name, these are stratus undulatus clouds. Is it the end of November already? I know I’m getting old. I have a birthday soon to prove it. I thought I just wrote about what November would bring us, and here it is done and gone already. How can that be? I think I have some answers, all of them as lovely as the month itself. Given the last two winters, we began this November with more than a little trepidation. We had good reasons for our collective unease. Would we be blasted with another surprise snow in the middle of the month like last year? Could we even begin to hope that November would be half as beautiful as October was? 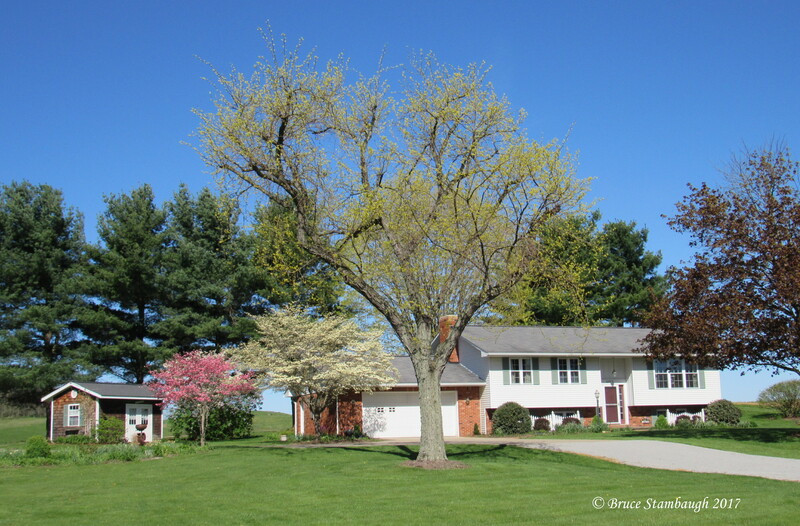 As you happily know, November gave her best to replicate October’s stunning weather here in Ohio’s Amish country. The eleventh month wasn’t quite as bright and pretty as October, but she sure tried hard. Even with standard time returning and the daylight hours growing fewer by the day, November was a welcome, pleasant surprise. It exceeded all expectations. Overall, the month turned out to be a much better than average November if only measured by weather. November charmed me with its hospitality, a welcome relief from the state of affairs on the national and international political front. It’s not too many Novembers in Ohio that you see a father and his young son walking along a sidewalk in short sleeves mid-month. Last year they would have been bundled up throwing snowballs. Municipalities, stores, and homeowners took advantage of the decent days to put up their holiday decorations. It beat trying to hang banners and Christmas lights in blizzard-like conditions. In some locales, Christmas decorations and Halloween displays stood side by side. I wasn’t going to judge. I just enjoyed the intended spirit each reflected, even if the timing was a little off. The horses and cattle had to be enjoying the extended stay in the open pastures. Frequent November rains made the grass as fresh as after April showers. In fact, folks were mowing their lawns this November on the same day they were plowing out their driveways last year. I took advantage of the excellent weather, too. I cleaned and readied my multiple bird feeders. I was hardly inside when I spotted a few infrequent Pine Siskins on the cylinder feeder by the kitchen window. They feasted on the cracked sunflower hearts. With my firewood supply tenuous, I had three pickup loads of split and seasoned hardwoods delivered. Over the space of three days, my wife and I had it all neatly stacked behind the garden shed. Remember, I said I was getting older soon. November’s brisk winds made regular appearances. That was good news for those who hadn’t yet raked their leaves. Their eastern neighbors may have a different viewpoint on that, however. We had days of rain and drizzle. We had clear blue-sky days, too. And we had those days of cloudy one minute and sunny the next. None required a snow shovel. Driving around the November countryside, the landscape seemed wider, more open. Perhaps that was due to the leafless trees affording a three-dimensional illusion, no special glasses needed. This November frequently offered amazing sunrises and sunsets for all to enjoy. Sometimes they lingered for the longest time. Mostly, though, you had to look sharp, or you would miss the colorful show, just like the month itself. Like Thanksgiving, November has come and gone. Bring on December and hope that it learned a little kindness from its closest sibling. It was unseasonably warm and unusually bright for late November in Ohio’s Amish country. The angle of the late morning sun gave depth to the barn in the foreground and created an artistic display of the windmill’s shadow upon the starched white clapboard farmhouse. “Splayed Shadow” is my Photo of the Week. The Corner of the Barn. I loved how the pine bows mimicked the curvature of the shed’s roof. But it was the old sandstones, now whitewashed, that really caught my eye. Those ancient stones of the 19th century barn have a lot of stories to tell about the farmers who have come and gone, and about the passersby who have driven or biked or walked past this beautiful old building. I sure hope they saw what I saw. 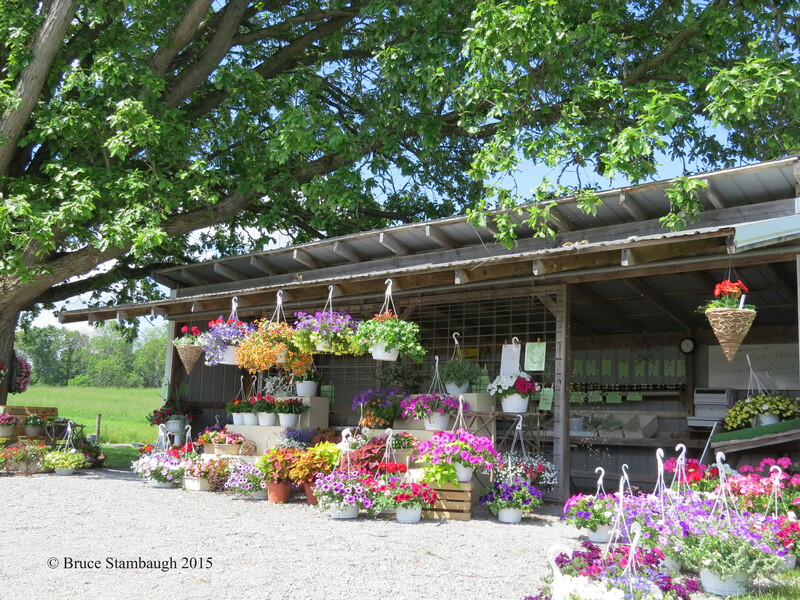 “The Corner of the Barn” is my Photo of the Week. I’ve been working since I was eight years old. To earn a little spending money of my own, my first job I went door-to-door selling seed packets. I’ve been working ever since, and that’s a very good thing. There is great satisfaction in earning money through hard work. That was especially true as a youngster who grew up in a family that had pittance left over for life’s extravagances. We weren’t poor, but we weren’t rich by earthly standards either. Rather, our wealth came in the joy of working together as a family and learning to enjoy work’s energy and accomplishments, whether we earned money or not. If it benefited others, payment was received in ways that far exceeded any monetary gain. If my siblings and I earned money helping others at businesses or homes, you could be sure we used the profits for wise choices. The candy store was just five minutes away. Of course, our folks taught us the advantages of saving and giving, too. I have my parents and grandparents, and likely generations before them, to thank for instilling work as a personal core value. Dad worked 43 years for the same company as a tool engineer. Mom was a household engineer before the profession was so christened. Living in Holmes County, Ohio, all of my adult life, I have come to appreciate the community’s emphasis on exercising a robust work ethic. I marvel at seeing it played out every day. I only have to observe my neighbor’s family gathering crops. Three generations are often literally bringing in the sheaves. That should be no surprise. Having a strong work ethic is common and a highly valued principle here. It’s one of the reasons our region consistently has one of the lowest monthly unemployment rates in Ohio. County residents pride themselves on enthusiastically employing their work ethic. That’s ironic for a society that holds humility in equally high esteem. Folks manage to balance that apparent contradiction for self and others successfully. The method to instilling the work ethic to the next generation is simple. Folks here both model and include younger generations in work. In other words, the adults give the youngsters responsibilities that result in projects completed. 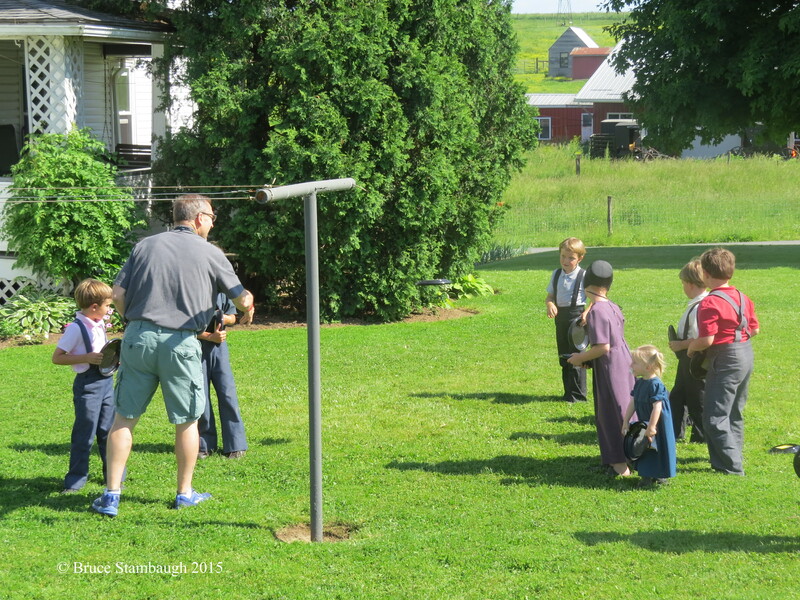 Children on farms help with chores. Feeding the livestock, gathering eggs, walking the dog all count as productivity. Drive around and you’ll likely see children including work in their play. I always get a chuckle when I see Amish children playing horse and buggy. A couple of toddlers sit in a wagon while an older sibling plays the horse. A short piece of rope serves as the reins. From time to time as a principal, I would get a note from home asking that Johnny be permitted to visit the local store to buy some grocery items needed for that evening’s supper. I usually approved the request by driving to the store and letting the sixth grader do his deed. At the produce stand we frequent, the entire family chips in to make the business go. From time to time, a request is made for an item not available on the shelf. Junior will gladly fetch the requested item from the field to accommodate the customer. It’s all in a day’s work. Of course, the work ethic extends far beyond our insulated world. Working and earning are universally esteemed characteristics. I’m glad we have Labor Day to remind us of that fact.